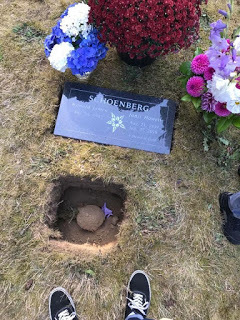 Jan's ashes were interred August 19th, 2017, with family and friends in attendance. Here is Jenny Schoenberg's tribute video to her mother for the interment. This is a link to a video our daughter Jennifer produced for our fiftieth wedding anniversary. It was also shown at Jan's funeral. Here's a link to her obituary. For more than fifty years Jan and I lived our lives together...from quite Southern streets of Charleston S.C....to a verdant rural county in New Jersey...to the University of Washington in Seattle...and then to the beautiful desert of Tucson...later back to the shores of the Puget Sound in Grapeview...then off for ten years to Washington D.C...and finally back to the Pacific Northwest. An Odyssean journey only Homer could have written. Fifty years filled with children, friends adventures. Filled with mostly happiness and some sadness--she lost both her parents in the early 70's. Fifty years filled with great satisfaction in her work, at Lawyer's Title in Tucson, then Mason County Title in Shelton, WA, while in Grapeview. Then for ten years at Booz Allen Hamilton in D.C., and finally, before retiring, sixteen years with Dame and Moore/URS in Seattle. Fifty years filled with friends, friends for life like her dear friend from D.C., Becky Briggs, and her dear friend from URS, Phyllis Oiye. And friends from my family, like my sister Cathy and my cousin Jerry. And her friends in her book club like Jeannie, Fabiola, Kathleen and Tina, and her friends in her knitting club like Starr Hastings. The origin of our Species, according to Darwin, is Natural Selection, selection from successful random events. The path of our lives contains choices we make, choices other people make, and random events. Some random events deserve more attention than others. One random event outweighs all others for me, for all of us, in that dimly lit Charleston apartment room where with a few words, my and Jan's eyes and minds met. In that brief magnetic moment was created a lifetime of love, fifty years of love for each other, for love for our children, our grandchildren, her love for her friends. And for everyone here, an unwavering love for everyone here, and all the people who became part of her life, all of them. Let us here honor the life of a true heart of gold. Let us be grateful that we've all have been so fortunate to have experienced her bountiful, wonderful love. Mother is the original relationship. When you are very young, what she is what you think people should be, what you think you should be, even what you think you are, at least until you begin to know yourself as someone separate. It is what is normal, what is right. From things like how you stir cake butter to how you hold up a buttercup to see if someone likes butter to how you say bread and butter when you go opposite sides around a lamppost in the street. In some ways it is hard to see her, you are so close. She's everything, the ground that is invisible because it's everywhere. She's a part of the way you see everything, understand everything, especially yourself, that as long as you are seeing and understanding anything she is with you. Maybe that's why it feels like Mom's still here so clearly to me, in a way that it hasn't with others I've known who've died. I've read before how people have conversations with their loved ones who died, but never have I felt like I really could. But with Mom I think I know exactly how it would go, how it would feel to have conversations with her about things that have happened this past year. Having three daughters...mother daughter relationships are so complicated. There's a push and a pull. The difficulties being your own person. My oldest is a new adult, she wants to be so close and then gets prickly...because she has to set herself up on her own...I remember that with Mom, when she dropped me off at college. She started putting stuff away in my drawers. I wanted her to go. As soon as she was gone I wanted her back, I cried. Last week I dropped Charlotte off at her first apartment, she's not living in the dorm this year, it's a twelve month lease so maybe she'll never live at home again. As soon as we unpacked the car she wanted me out, she didn't want me to help. Then she came home the very next day for a visit. It's wanting advice, then not wanting it, because you need to do it on your own. The push and the pull. You go away, and you come back. When you're really little, at the park, at school, when you go to college. You go away and come back. Then one day you can't come back anymore. It happens at different points for everyone and I'm sure it always seems too early but this was too early. I want to keep coming back. But in some ways you can come back. It's still with you, in you. Like when mom was dying last summer, I know she was thinking of her own mother, Nana. And Nana was there, in her, in the way Mom knew her. But there are the parts that aren't with you, because as close as you are you are separate beings, you are different, that's what makes growing up difficult sometimes. Last summer I talked at her funeral about the things she bequeathed me, the things from her that are in me, books and the love of little pebbles on a beach and all of that... But it turns out the things you miss the most about your mother were the things that weren't you, that somehow never settled inside you. The ways in which she pushed you to try something that didn't come naturally to you. The things that are a mystery. There are lots of those things, of course many things Jenny or Joel got from her where I didn't, and ways in which they knew her which were different from mine. For some reason, maybe because it was one of my earlier memories of being with her, and one of the last, I am thinking of something I didn't share with her, but I did share with her, if you know what I mean. A little thing. She liked to go out shopping, doing errands, going to the library, puttering around the town center whatever it might be wherever she was living. I do all my shopping via Amazon. Buy books that way too. It's not something I've done much with my kids either. Shopping--in Seattle when I was little. Jenny and Joel weren't with us, it was probably a big deal to be out with her by myself. Coming down the hill on a bus. lunch counter. I think Woolworth's. Grilled cheese. Mom stopping to look in Windows. Skip forward almost fifty years, though it happened imbetween. Taking her out after her first surgery, first time out, after grandma's burial out here. The library and the bookstore and the knitting shop and popping into a few other places, wherever anything was interesting. The Christmas after she became sick was the last time, buying slippers so she wouldn't fall. She wasn't sure if she should get the pricy ones. She did. And we looked for thank you cards, for all the people who were writing and sending her things. We saw a movie, imitation game. Last time we really went out just together. I miss these trips. Maybe I can import this habit into myself after all. Not sure. Last week I took Char to ikea to get stuff for her new place and we were all efficiency. We zipped in and out. Got what we needed. We were done. We didn't ramble. I'm not a rambler. There are things I cannot recreate, that are lost. Parts of her unknown to me I will never know. Ways she was I will not be. Then there are the parts I can come back to, will always be able to come back to, in myself or in Jenny and Joel, and all the grandkids, and everyone who knew and loved her. Thank you all for that. I would like to add, Janis was an unusual experience for all of us, but what should not be overlooked in our expression of her love, is that she was supremely intelligent. She chose not to transform it with a college education, but she revealed it in her work and every day life. She had a passion for books and had developed a background in literature that would have impressed anyone with a liberal arts degree. The result was the respect for her thoughts on whatever she chose to offer us. I'd like to present an example. There was a time when we had dinner parties crowded with wine geeks. After a pour opinions abounded but occasionally Janis would speak up and a hush would fall as everyone listened to what she had to say. Her love was as valuable as gold which she shared generously, but even greater was the respect for what she thought that was valued by me, her family, her friends, her colleagues at work. And as important was her honesty. She was completely undevious, you always got her honest opinion. Well almost always. Sometimes, when the truth was inconsequential and your feelings were involved you might get a lie, a "white lie". There would be times she thought your feelings mattered more than the truth. The fact is, all of us, we have had the experience of knowing a truly remarkable human being.